I don't know about you but in my house my kids love playing iPad and iPhone games. Whether we are out to dinner or riding in the car my kids are always entertained and most importantly, quiet, when they are engaged in great apps. Dexter, my 5 year old knows the difference between games and "educational" games. Most times he is able to play what he wants on his iPad but there are other times, like before bed, during Oliver's nap etc that we ask him to play educational apps. Oliver, on the other hand, LOVES educational apps so that is pretty much all he plays on my phone. I love when companies make learning fun so they hardly notice that they are learning! 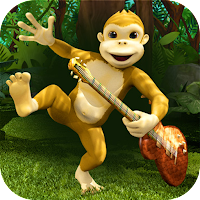 I was recently introduced to Gorilla Band, a super cute storybook app from Wasabi Productions. I asked Dexter to play with it first. He enjoyed following the directions by giving the gorilla a "poke to remind him of the time". He also loved exploring the app and he was not only entertained but was following directions (which I loved). The app is 3D and has great realistic jungle noises so it almost feels as though you are in the jungle with Mrs. Melody (cute name eh?) As a reading teacher I appreciate that they highlight the word that is being read in the story so that the young readers can follow along. When I gave Oliver my phone to play Gorilla Band he was super excited. He just wanted to keep hitting the gorillas to get them to play the drums, come to their lesson etc. Then I showed him the music video (see below) from the parent section. That drew him in and within seconds he was dancing and whirling around. He must have replayed it at least 10 times in a row. *There is an in studio game to play too! *My 2 and 5 year old both give it two thumbs up! *They are giving a percentage of their proceeds to charity (see below). Download HERE! 10% of proceeds from app sales will be donated to VH1 Save The Music Foundation to support the charity's work in restoring instrumental music education programs in America's public schools and raising awareness about the importance music as part of each child's complete education (until December 31, 2013). I can't wait to check out their other games from the iTunes store! I am sure they will also be a hit with the boys! That looks like a cool app!!! Have to try it with my kiddos! Looks fun! I don't have an iPhone or IPad, but maybe I can find it for Android. UGH! I can't WAIt until I get an iphone! I don't knw what was wrong with me when I chose my blackberry! We get NO cool/fun apps like iphone does! Great post! Technology is advancing so fast that till we are used to new technique other new technology is introduced. This makes me wish I had an iPhone. This is perfect to keep little people busy when Mama has to run errands!